A joint operation by the Los Angeles County Sheriff’s Department and the California Department of Justice led to the Seizure of 553 firearms in Agua Dulce, Unincorporated Los Angeles County last week. The Los Angeles County Sheriff’s Department’s Palmdale Station received a crime tip that a local man was in possession of a large arsenal of firearms and that he was a convicted felon. The investigation was led by the Palmdale Sheriff’s Station’s Detective Bureau. It included the station’s Summer Crime Enforcement Team, Palmdale Partners Against Crime (Special Problems Unit), the Bureau of Alcohol, Tobacco, Firearms and Explosives, and the California Department of Justice. On June 14, 2018 at 0730 hours, the team served a search warrant in the 34700 block of Caprock Road in the unincorporated area of Agua Dulce. 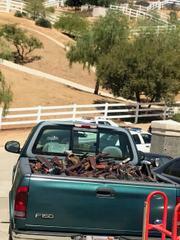 During the search, Manuel Fernandez, a 60 year-old male resident of Agua Dulce was arrested for being a felon in possession of firearms and a felon in possession of ammunition. At the residence, 432 firearms were seized during the service of the search warrant. The first warrant led investigators to second location connected to suspect Fernandez. The second warrant, served in the 34900 block of Sweetwater Drive, Agua Dulce, resulted in the seizure of 30 illegal firearms possessed by a female associate. The female suspect was not home at the time of the warrant service and has not returned to the location. Detectives are preparing charges for the District Attorney for filing consideration. "The Summer Enforcement Team was funded by the Board of Supervisors for operations like this with a beneficial impact on public safety for our unincorporated communities throughout the summer months,” stated Supervisor Kathryn Barger, representing Los Angeles County’s 5th District. “I applaud the Palmdale Sheriff's station, the City's Partners Against Crime and the Department of Justice who worked in conjunction on this effective operation and massive seizure of illegal firearms." A follow-up warrant to the residence of Manuel Fernandez on June 15, 2018, led to the seizure of an additional 91 firearms that were hidden within the home. Detectives also seized computers, cellphones, and hard drives from the residence believed to be involved in the illicit purchase of firearms by the suspect. Due to the large number of firearms recovered, detectives enlisted the assistance of the Federal Bureau of Alcohol, Tobacco, Firearms and Explosives (ATF) for tracing the purchase origination of the weapons. Agents from both the California Department of Justice and ATF will be providing resources as the case continues through the court process. The suspect was arrested and booked at Palmdale Sheriff’s Station on charges of Felon in Possession of Firearms (129800(a)(1) PC), Possession of an Assault Rifle (32625(a) PC, Felon in Possession of Ammunition (30305(a) PC) and Possession of Large Capacity Magazines (32310(a) PC). The suspect’s booking number is 5340090. He bonded out from the jail ward of Los Angeles County Medical Center on June 15, 2018 and has a schedule court appearance date of July 9, 2018 in Antelope Valley Superior Court. For additional information, please contact Detective John Roth, Palmdale Sheriff’s Station at (661) 272-2442.